Model Suki Waterhouse complements a bold print pant with a jagged edge patent-leather platform wedge. Wedges are the perfect solution if you like your shoes to give you a few inches of height but you don't like the pain and suffering a heel can cause after a few hours. Wedges are the "have it your way" shoe of fashion. They come every style from platforms, ankle-straps, canvas sneakers to the couture statement shoe. They should be styled based on their particular shoe group. You might not have believed someone who predicted there would be a shoe that combines a workout shoe and a stylish high-heel. However, it has happened with the advent of the wedge sneaker, which is the hottest thing to hit the street. Put together a chic, casual outfit with a pair of worn and torn boyfriend jeans that are cuffed high to reveal your funky high-top wedge sneakers. Look for styles that combine neutrals such as gray or black with animal prints or mesh inserts for an edgy style. These will pair nicely with more classic pieces like dark sweaters or jackets. You can also invest in a vivid sneaker that color block brights such as orange and fuchsia. Wear them with track pants, track shorts or other sporty separates to give them a super-stylish, colorful look. Accessorize the outfit with a baseball cap and leather knapsacks for the ultimate in street style. Unlike some other heels, wedges can serve both form and function. For a comfortable heel that is modern yet classic in style, wear a round-toe navy or black wedge with a blazer and skinny jeans. Keep the outfit monochromatic, except for a striped top. Use dramatic accessories if you want to add some extra personality. Go big and bold with a style statement shoe and wear a architecturally abstract wedge, or one that is designed with a bright print covering the heel. The structure of a wedge heel also allows designers to play with cutout designs which further create a bold statement. Wear a pair of wedge ankle boots or stappy sandals with an understated, but modern dress, such as a black asymmetrical sheath dress or a black cropped tuxedo suit. Keep jewelry minimal to let the shoes do the talking. 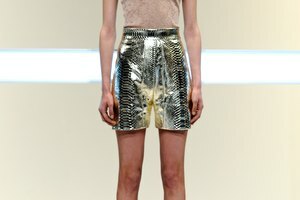 A pair of high-waist dress shorts are suitably complemented by a pair of wedge heels. The substantial shoe balances the shorts nicely. Pair a calf-defining ankle wrap platform wedge in a luxe fabric such as satin with a semi-formal black short suit set for a less traditional, more sultry take on an evening suit. A monochromatic black suede wedge bootie is dressy enough for a sophisticated evening outfit such as a pencil skirt and peplum top. A wedge bootie also gives a pair of dark denim and V-neck T-shirt some added style, especially in a leopard print. Wedges are not always sky-high and fashion-forward. There are wedges modeled after such shoes as mary-jane or loafer shoes, which contain a thick, even heel. This adds height while distributing your weight evenly for more comfort over a longer period of time. Wear a chunky wedge sandal with any outfit you'd wear a pair of flat sandals or ballet flats. A pair of slim-cut jeans and a soft T-shirt; a pleated skater skirt and a button-down blouse; baggy cargo shorts and a tank - these are all wedge-sandal-approved outfits. HuffingtonPost.com: Shorts And Heels: 37 Celebrities Attempt The Look... Who Pulls It Off? Bakke, Angela. "How to Style Wedges." Synonym, https://classroom.synonym.com/style-wedges-7339.html. Accessed 21 April 2019.